In the next few weeks, I will be adding a line of hand dyed silk to my available fiber supplies. 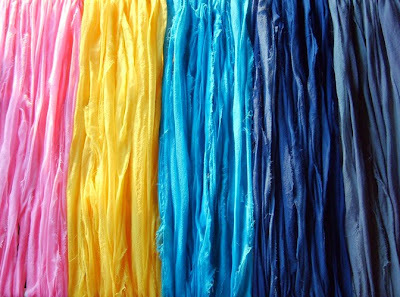 The vibrantly dyed silk gauze will come in sets, or collections, of colors. Each color collection will have a fun theme and be available in limited editions. I like to dye my silks individually and in small batches so I am only making a small quantity of each colorway. My hand dyed silks are wonderful for nuno felting! They are what I use in many of my own feltmaking projects. In the photo above, you can see some of my dye work on the drying rack. I'm very, very excited about offering my hand dyed silks for your nuno felting projects, fiber art, and textile design. I have been dyeing most of my own silk for many years now. It is always like unwrapping a little present every time I see the final color come through on a piece of silk. If you are interested in purchasing my upcoming silk collections, please bookmark my online shops at Etsy and ArtFire. I will also be announcing their arrival on my blog when the time comes. And, if you'd like to see some examples of my own nuno felted fiber art, take a look at my flickr photos. Wow - what a beautiful rainbow! Wow...that's some serious dipping in the dyepot...the colors look great!! !